OK, first new recipe of 2019! It took a little while to sit down and do this, as I’ve had a lot going on. The holidays were lovely, and now I’m preparing for a trip next weekend, and I’ve been starting some new projects. 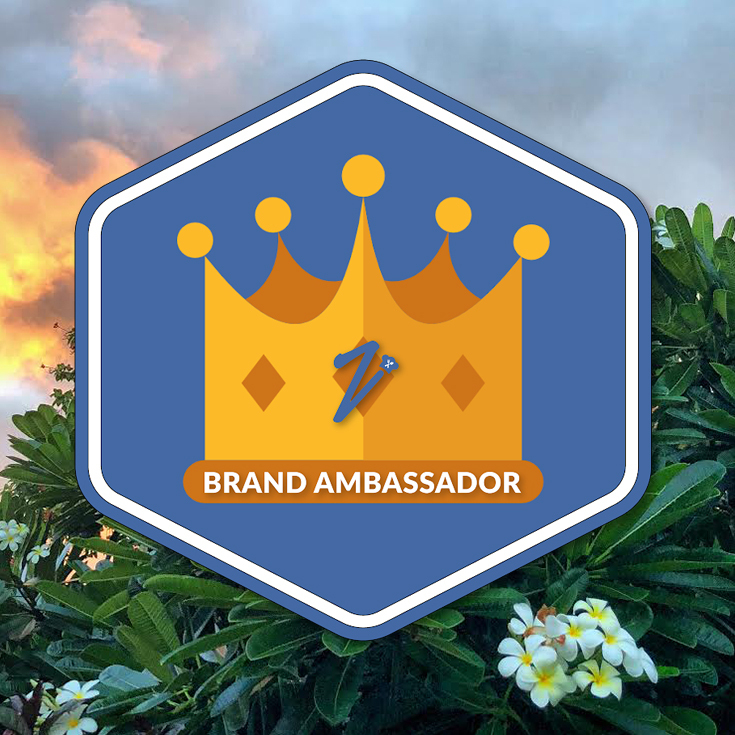 I’ve taken a position as the Honolulu ambassador for an online influencer marking company called Zipkick, which is very exciting. Basically it’s my job to cultivate a local community, recruit more influencers and reach out to brands to connect them with the company and it’s network. I’ve been toying with the idea of writing a post about becoming an influencer and success on social media. We’ll see. I’m still shocked at how far The Picky Gourmet has come in 3 years. I never thought I’d be turning it into (hopefully) a career. I also never thought I’d be doing an egg recipe. All the way into my adult years, eggs freaked me out. First off, there’s so many ways to cook them… whenever a waiter would ask how I’d like my eggs, I’d just say no thanks. Where do you start? Scrambled seemed like an obvious choice, so that was my first attempt at liking eggs. Nope, nope, nope. I was not a fan. Still not a fan. I thought the fluffy, yellow eggs looked more appetizing than those weird runny yolks, but eventually, I learned the error of my ways. I started practicing cooking eggs to give them another shot. I didn’t get far past the fried egg. I’m sunny side up/runny yolk for life now. Especially when it involves dipping some kind of bread into it. It tastes like melted, buttery goodness. Suddenly the whole “put an egg on it” movement made sense to me. Heat the olive oil over medium heat in a large pan or skillet (about 12 inches ideally). 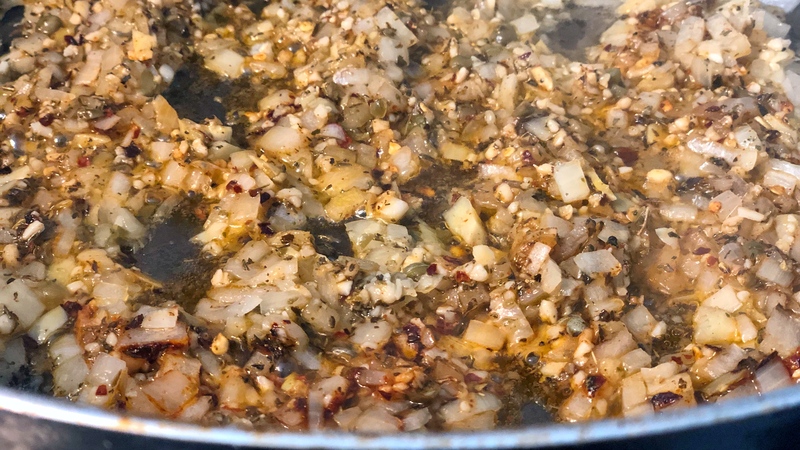 Add in the onion, artichoke hearts, capers & garlic. Stir occasionally for 1-2 minutes, until the onions become translucent. Add the red pepper flakes, thyme, basil, paprika & oregano. Stir into the onion mix for a minute. Add the can of diced tomatoes & tomato paste. Season with a pinch of salt & pepper to taste. Let it gently boil for about 30 seconds, then reduce the heat to a simmer. Stir occasionally, letting the sauce thicken for about 5-7 minutes. Using the back of a spoon, create six divots in the sauce. Crack an egg in each cavity, then cover the pan. Cook for 4-6 minutes, until the whites are cooked & the yolk is to your liking (I prefer a shorter cooking time for a runny yolk). Garnish the dish with the sliced banana peppers, fresh basil & fresh parsley. Serve family style with toasted bread slices. Easy and delicious. My favorite things. This was one of those things I had to stop myself from eating because I was getting full but didn’t want to stop! 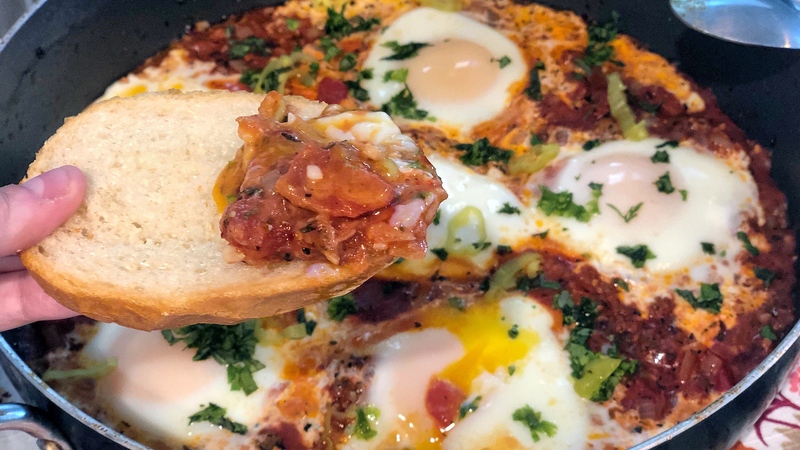 I love the runny egg, I love the spices and herbs, and I love getting the salty pops from the capers and the sweet, vinegary bite of the peppers on top. You can scoop individual servings into bowls for people, but I like just digging right into the pan with the bread. I love a recipe that looks (and tastes) impressive, without a ton of work. 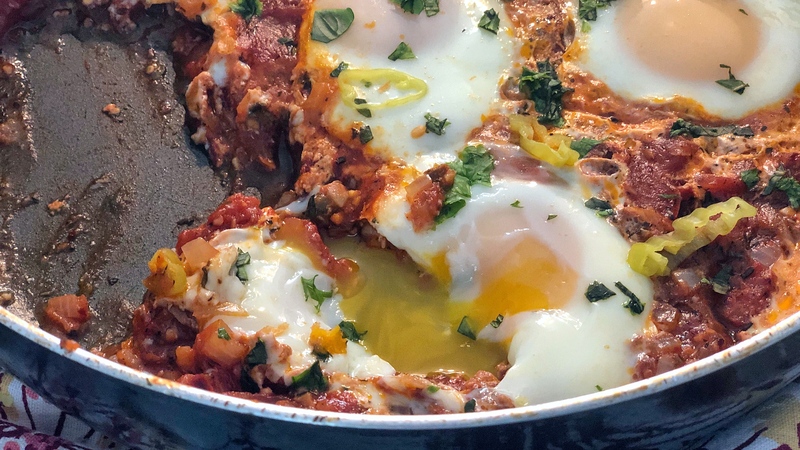 This is essentially just throwing a bunch of delicious ingredients together, and when you serve it out of the pan, clean up is that much easier. This is also a great “pantry grab” recipe. Pretty much everyone has cans of tomatoes and tomato paste in their cupboards. If you don’t have jars of artichoke hearts, capers & banana peppers, that’s fine. This is a great way to use up the ingredients you do have and love. You can use jalapenos, or you can leave out the spicy pepper flakes altogether. You can add more garlic, or something healthy like spinach. 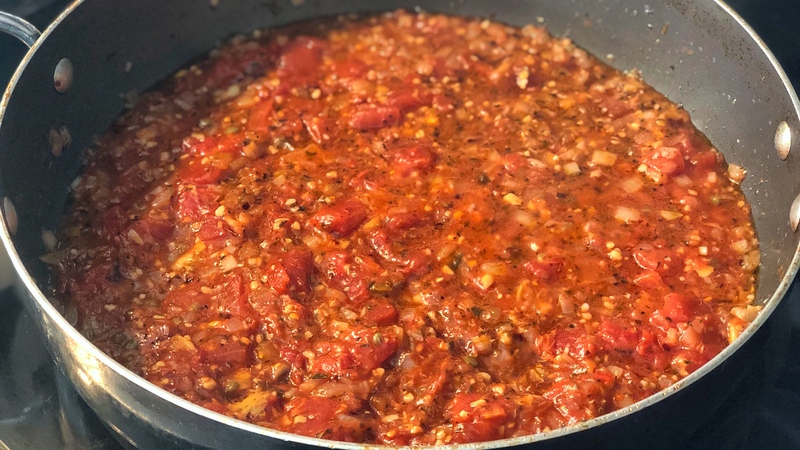 You can substitute parmesan cheese for the salty capers or that last bit of jarred marinara sauce no one it going to use in place of the tomato paste. Use your favorite herbs and make it your own. 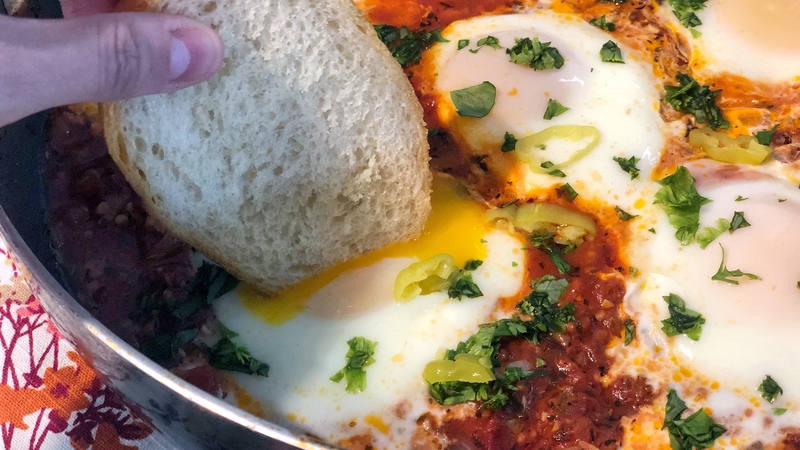 As long as you have a thick, tomato sauce base, there’s a million ways to make eggs this way. This is a fantastic option for a brunch where you want to have a few different dishes. 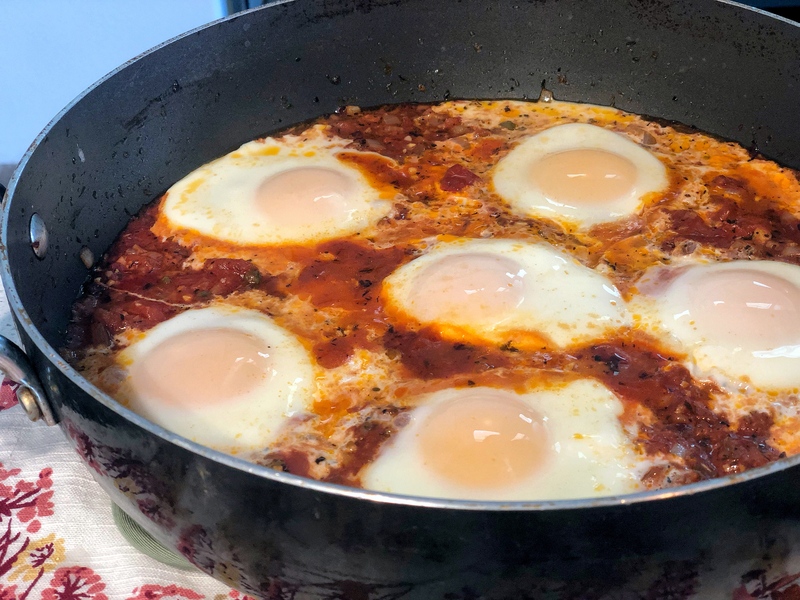 It satisfies the need for eggs, without you having to make them to order or worry about cooking them correctly and you can even make the sauce the night before to save time. 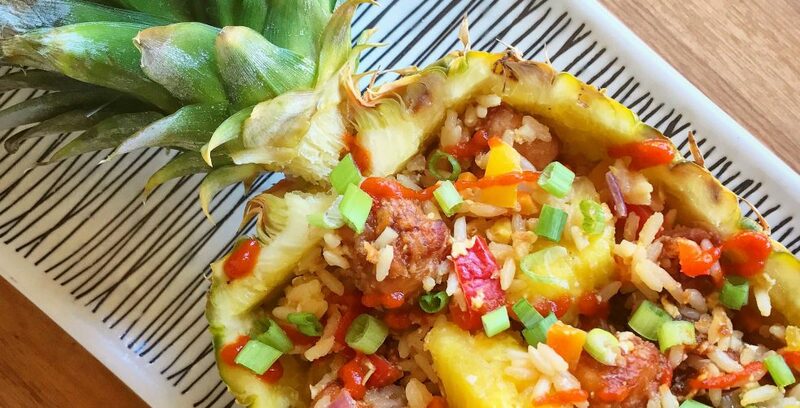 With just a few minutes on the stove top, you have a show-stopping dish. I’m already trying to think of the next time I can make this. It would be perfect for a Super Sunday pre-game brunch (since the big game airs at 1:30pm out here in Hawaii) or for when my family comes to visit next month. Actually, this is just perfect for any breakfast, any day. I have a feeling this is going to become a staple in our household. I promise to stop making it long enough to come up with a few new recipes soon. I’ve got some ideas that I can’t wait to try out when I’m back from traveling next week. See you soon! 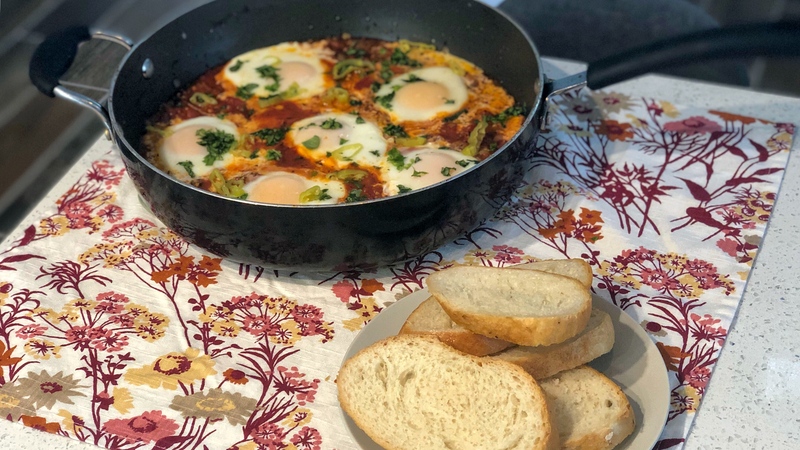 Great recipe and very similar to ‘shakshuka’….